Even though his music is 400 years old, Claudio Monteverdi’s madrigals can still strike a chord with contemporary audiences, because they wonderfully explore love with all of its thorns and fragrance. The intimacy of the madrigals made them a good fit for “Songs of Love and War,” which Portland Opera staged at its newly christened Gregory K. and Mary Chomenko Hinckley Studio Theatre on Friday (February 17). The music was evocatively conveyed by members and alumna of Portland Opera Resident Artists program under the direction of Christopher Mattaliano, and the production was the first in the company’s inaugural Vino e Voce series. Within that framework, each madrigal could be experienced as a separate episode. In “O mio bene” the men longed for love. In “Bel pastor” the women tried to extract a promise of how much the men will love them. There were sensual moments punctuated by statements, such as “Love mixes flame and ice,” that have lost nothing in the last 400 years. Still, it was difficult to avoid imagining the characters in a story that had continuity For example, the bass might pursue the mezzo in one song, but he might be involved with someone else in the next, and that would then be followed by something completely different. All of the action took place on top of and around an extremely large bed, which was placed in the center of the hall surrounded by the audience on all four sides. Sopranos Lindsay Ohse and Antonia Tamer, mezzo Kate Farrar, bass James Harrington, baritone Ryan Thorn, and tenor Aaron Short flirted, frolicked, fumed, and fought with élan. They impeccably expressed the content and emotion of each piece with ardent singing, and their ensemble numbers were remarkably well balanced. But with the singers running around in satin pajamas and nightgowns for 90 minutes, the production became a bit one-dimensional. Besides the super-large bed, the only other prop was a large satin sheet. Since the text referred once in a while to flowers and food, a bouquet or a picnic basket would have been a nice diversion. The chamber orchestra, sequestered in one corner of the hall, sounded terrific. 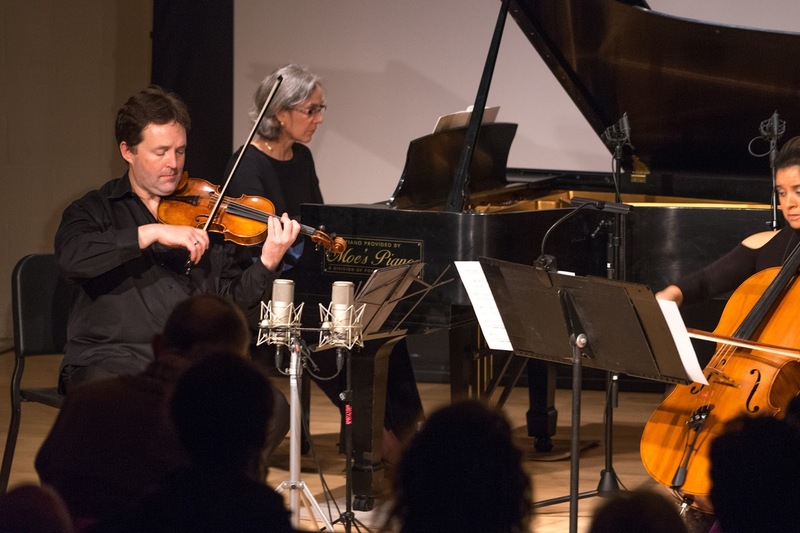 It consisted of Dylan Rieck (cello), Hideki Yamaya (theorbo and Baroque guitar), and Nicolas Fox, who conducted the entire enterprise from the harpsichord. Because most of Portland Opera productions have been moved to the summer, the new Vino e Voce series marks a brave attempt by Mattaliano and company to redefine opera for the winter months. “Songs of Love and War” was a good start. David Shifrin will play a couple of clarinet concertos with the Vancouver Symphony this weekend. My preview of the concert, including an interview with Shifrin about the music, is in today's issue of The Columbian newspaper. In addition to his work with PSC, Dr. Zopfi is an accomplished Director of Choral Activities at the University of Puget Sound (located 150 miles north of Portland). Recently, the university completed a major rescheduling effort which resulted in an unresolvable scheduling conflict with PSC’s rehearsal needs. While the university-wide change is being made for good reasons, it unfortunately will prevent Dr. Zopfi from continuing his position with PSC after this season. With this in mind, we are now activating our search for the next artistic director of Portland Symphonic Choir. The Board of Directors is working diligently to ensure a successful search and transition process. As the great Robert Shaw once said, “as soon as we find each other, we invite the miracle to begin”—this sentiment will be at the heart of our search. The Gould Piano Trio and Robert Plane (clarinet) will give a concert at Grace Memorial Episcopal Church on Thursday March 30 at 7:30. They have soloed individually with orchestras all over the world, have 25 CDs as a trio, the pianist has made 17 solo recordings, and collectively they are pretty impressive. Plane's recording of Finzi’s Clarinet Concerto won Classic CD Magazine’s ‘Best Concerto Recording’ Award and was selected as BBC Radio 3’s recommended version in ‘Building a Library’, whilst his recording of Bax Sonatas was shortlisted for a Gramophone Award. His recording of Messiaen’s ‘Quartet for the End of Time’ with the Gould Trio was praised by BBC Music Magazine as the ‘best modern account’ of this monumental work. The Gould Piano Trio is brilliant - played Wigmore Hall London, England (the UK’s chamber hall equivalent of Carnegie Hall)in February, and Portland in March! Tickets, which are selling briskly, go for $30. You can get them online at Grace Memorial. Although the fast pace of modern life and technology has made many people addicted to anything short and shocking, there are still those who search for things that are slower and deeper. They stuffed Kaul Auditorium to the brim last Sunday (February 12) for the final concert of the Arvo Pärt Festival and were rewarded with superb performances by Cappella Romana and the Third Angle New Music Ensemble. The program, led by Alexander Lingas, featured music by Pärt, James MacMillan, and John Tavener that drew inspiration from ancient hymns. Even the secular piece by Thanos Mikroutsikos shared a meditative sentiment that fit naturally with the others. It is too bad that Kaul Auditorium does not have some reverberation. A little bit of reverb would have warmed up the sound even more and added the extra bit of awe. The twenty-five singers of Cappella Romana filled the hall with a gorgeous sound, starting with “Da pacem Domine” (“Give peace, Lord”), which Pärt wrote in response to the train bombings in Madrid in March of 2004. Divided into four parts, the men and women delivered the somber text with well-balanced, resonating, sustained yet bell-like tones (including some subterranean notes for the basses) that placed everyone in a meditative spell alongside the feeling of unending expansiveness. Another hypnotic piece was MacMillan’s “Who are these angels?” Apparently, MacMilan wrote some of the music when he was 17 years old and then refashioned it in 2009. The men sang a Latin text attributed to Augustine that probes mankind’s mortality with a series of questions. The women responded with the refrain “Who are these angels and how shall I know them?,” singing with a purity of tone and zero vibrato that was absolutely ethereal and tranquil. The string quartet fluttered about, ascending to some very high notes and delicate, free-range glissandi that suggested an angelic response. An additional highlight was a brief, yet beautiful solo by violist Adam LaMotte. Pärt’s“Alleluia-Tropus” (2008) received its U.S. premiere at this concert. Sung in Church Slavonic, the music featured a joyful refrain of “Alleluias.” Written as a dismissal hymn for St. Nicholas, the final “Alleluia” created a sense of suspension because it was sustained for a long time. “Funeral Canticle,” composed by Tavener in 1996 in memory of his father, was used in Terrance Malick’s film “The Tree of Life.” The solos, sung in Byzantine Greek by John Boyer, featured microtonal adjustments that sounded very Middle Eastern. Each verse that the choir sang started with a simple melody that morphed into harmonically intertwined passages. Overall, the text gave me the sense of someone climbing stairs that went higher and higher. Slowly descending and ascending lines were also expressed in Mikroutsikos “Slow Motion,” an orchestra-only piece. The music paralleled the austere and plaintive call of the other pieces on the program but without the religious context. The final piece on the program, Pärt’s “Te Deum” (“Thee, O God, we praise”), began with an otherworldly drone from the wind harp, played from a recording. The choir sounded magnificent with excellent dynamics, including impressive double-fortes, for example, with the words “pleni sunt caeli et terra maiestatis gloriae tuae” (“Heaven and earth are full of the majesty of thy glory”). Other highlights of the piece included crystalline lines from the women and a lovely solo by soprano Catherine van der Salm. The final “Sanctus” was light and feathery. The singers were supported with sensitively by the orchestra, which included the big chords from the prepared piano (Susan DeWitt Smith) that punctuated the end of a couple of passages. For those who missed the concert, the good news is that the a cappella pieces from the program will be part of a new recording by Cappella Romana. Kudos to the ensemble and to producer Mark Powell for bringing such powerful music to Portland. Hailed by Michael Tilson Thomas as “an excellent violinist,” Tomas Cotik is internationally recognized as a soloist, chamber musician, and professor. A much sought after recording artist, Dr. Cotik is currently involved in more than fourteen CD recordings for Naxos and Centaur Records, which have received over a hundred reviews and the highest praises from some of the best-known publications. 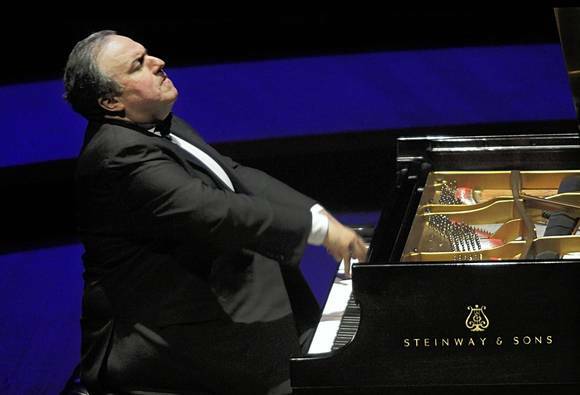 He forms a Duo with pianist Tao Lin and was a member of the acclaimed Amernet, Delray, and Harrington string quartets. Committed to passing on his passion for music, Dr. Cotik taught at the University of Miami, Florida International University, and West Texas A&M University. He was appointed assistant professor of Violin at Portland State University in 2016. The 2017 Grammy Award for Best Surround Sound Album for classical music went to the Seattle Symphony for its recent recording of music by Henri Dutilleux. For more information, read this report in The Seattle Times. Before any music was played, the words projected onto the back wall of an intimate concert hall stated “Silence is the pause in me when I am near God.” That is not the typical kind of statement that one sees on any wall in Portland, Oregon, but it really set the tone for the concert given by Third Angle New Music Ensemble that I heard on Thursday, February 9th of Studio 2. 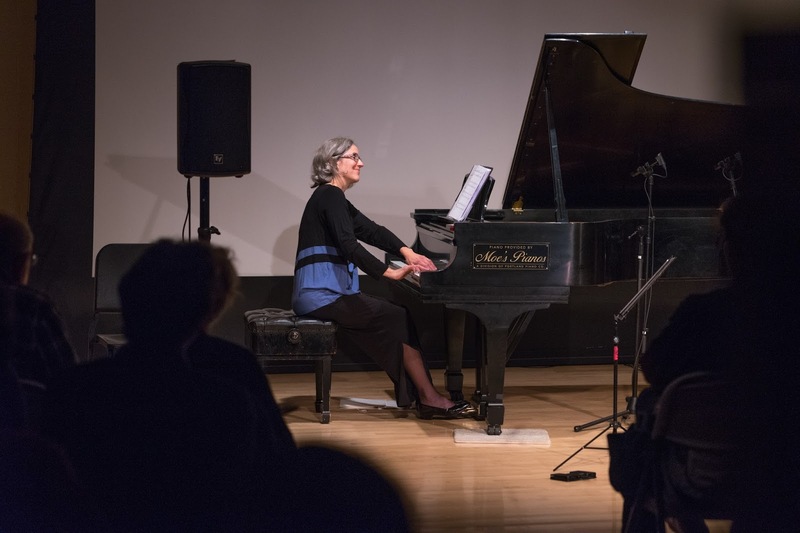 The words were quoted from the great Estonian composer Arvo Pärt, whose spiritually-inspired music was celebrated during a week-long festival in Portland, sponsored by Cappella Romana. Third Angle’s program, cleverly entitled Pärt and Pärcel,” featured three works by Pärt plus works by two young Estonian composers: Marianna Liik, and Tõnu Kõrvits. Pärt’s music often uses a style that he calls Tintinnabulation in which the notes of a triad are maintained in slow arpeggios or drones while other voices unfold melodies on the notes of the scale. One of his most famous pieces, “Spiegel im Spiegel” (Mirror in the Mirror”), as played by violinist Ron Blessinger and pianist Susan DeWitt Smith showed off this style perfectly, creating a slow moving yet almost weightless atmosphere with notes rising and falling around each other until they beautifully faded away. Featuring the Tintinnabuli-style, “Fratres” (“Brethren”), was also given a mesmerizing performance by cellist Marilyn de Oliviera and pianist Smith. De Oliviera wonderfully negotiated a whipsaw series of notes while Smith evoked chime-like tones from the piano. The combination sounded ancient and contemporary at the same time and was breathtakingly serene. Pauses played a big part at the beginning of Pärt’s “Mozart-Adagio,” a piece that fuses his Tintinnabuli-style with a theme from the “Adagio” movement of Mozart’s Sonata in F Major (K. 280). Performed with grace by Blessinger, de Oliviera, and Smith, the “Mozart-Adagio” was a delightfully arresting, especially the places where dissonant notes met. Pärt’s fame and influence is probably unavoidable for any young composer growing up in Estonia. “Kulgemine” (“Wending”), written in 2012 by Marianna Liik for piano and electronics was very atmospheric, tending away from warm colors to something cooler. Perhaps the bell-like tones that Smith created at the keyboard added to that effect. The electronically-generated sounds became loud and fairly threatening – as if a huge cloud had rolled into the room. By the time it dissipated the music acquired an hypnotic, timeless quality so that the end-effect was similar to Pärt’s. To close the concert, Blessinger, de Oliviera, and Smith played Tõnu Kõrvits’s “Head ööd (“Good Night”). The piece had a melancholic undercurrent that slipped from sighs to anguished shudders. Sometimes the air would clear and the mood would lighten a bit – with feathery-light moments suggesting a pleasant journey ahead. All of the instrumentalists deserved kudos for their sensitive playing, yet Smith was the real anchor for the evening. Hopefully, we won’t have to wait long for another round of Pärt. Blessinger, Artistic Director of Third Angle, will give us the pärticulars in the near future. All Classical Portland brings you its first ever Love-Fest Fundraiser! A full-on, “no holds barred” celebration of the music YOU love, the day promises to be thoroughly joyful and entertaining. All Classical Portland needs your financial support like never before, so tune in and consider re-upping your support of this service. Whatever extra you can afford to give to show your love on this day of appreciation is the right amount, whether it’s an extra $5 in the kitty, or $500. Just as you would give a gift to a loved one on Valentine’s Day, give to All Classical Portland in honor of love, music, cultural community, your partner, your parents, sister, brother or grandchild… make a dedication while you’re at it! All day on Tuesday, February 14th you can contribute by calling 1-888-899-5722, or donate online at allclassical.org. On this date in 1880, German opera composer Richard Wagner writes a letter to his American dentist, Dr. Newell Still Jenkins, stating "I do no regard it as impossible that I decide to emigrate forever to America with my latest work ["Parsifal"] and my entire family" if the Americans would subsidize him to the tune of one million dollars. extra note: Dr. Jenkins moved to Dresden, Germany and practiced there most of his life. He invented porcelain enamel. Monday evening at the Schnitz saw the Oregon Symphony perform Symphony No. 9 in E Minor, Dvorak's famous 'New World' Symphony, as well as a Beethoven concerto and a striking new work by Sebastian Currier. quickchange: Hectic, repercussive, tumltuous, like busy traffic that suddenly detoured into a mystic silent alleyway. minute waltz: Chuffing 'cuckoo, cuckoo,' discordant yet sweet horns. adagio: Elegiac, hypnotic--the ability--nay, necessity-- of drawing in the listeners' imagination in the shortest possible time was on display. nanoscherzo: Tootling, mechanical, tock-ticking. kaleidoscope: Brass squawking, imploring, cajoling, sighing unison chonking, secret whispering between sections. This piece was imaginative and bold, and the OSO handled it like champs. Pianist Yefim Bronfman joined for Beethoven's Piano Concerto No. 4. in G Major. This much more quiet, subdued work seemed to be right in Bronfman's wheelhouse. The orchestral opening was suitably grandiose yet not overblown, and Bronfman's brilliant runs of thirds were shining and crisp at the outset. The delicacy of his touch was almost surprising--nothing was ever overstated. The orchestra succeeded at the incredibly difficult task of allowing the gentility of the pianist's touch to yet shine through the orchestral texture. Kalmar's sense of balance was superb, and the orchestra followed. The numerous trills needed to be kept fresh and varied in the latter movements, and Bronfman again did not disappoint, going on further to display an entirely different timbre for each individual voice within contrapuntal sections to a truly marvelous effect. This concerto, so different from some of Beethoven's more iconic works, was fresh and lively in Bronfman's hands. The second half consisted of Dvorak's iconic symphony, labeled 'From the New World.' The genesis of what might be thought of as an 'American' sound for classical music, the OSO did not shy away from the bold statements to be found herein. The grandiose opening theme built in the brass until it was like towering thunderheads piling up over a far landscape. The strings sang a prairie lullaby with tenderness and rusticity, tossed gently between the strings and solo flute. In the second movement the woodwind choir played the tender theme with such warmth and care that it enfolded the listener in a womb of calm and repose. The explosive exposition of the fourth movement featured controlled power from the brass--pushing the absolute limit without going over the edge. The delicate tremolando from the violins, the saltando theme when violas were the only strings playing, the powerful, sawing theme from the low strings--all were executed to perfection. The transportative nature of the music at this concert lay not in the compositions alone, but in the interpretation--superb execution by elite players is required to complete the effect. Kalmar's reading was as expansive and wide-ranging as the music required to bring its meaning to fruition. This is what the OSO can deliver when they are at their best--and Monday night they were indeed. and 14 other Oregon Symphony premieres; and delivers another major recording. (PORTLAND, Ore.) – Music Director Carlos Kalmar and President Scott Showalter have announced the details of the Symphony’s 2017/18 Season. In the new season, titled “A New Dimension,” the Oregon Symphony focuses on three social themes: immigration, environment, and homelessness. The groundbreaking Sounds of Home series, like its predecessor SoundSights series, is comprised of three subscription concerts, each with a visual component. But Sounds of Home goes further – into a new dimension – focusing the power of music on the subject of home. The series explores three specific issues critical to our home community and the wider world: immigration, the search for a home; the environment, our collective home; and homelessness, the need for a home. The series will feature collaborations with other arts organizations and also with social service and environmental agencies, whose work addresses one or more of the series’ themes. The Oregon Symphony aims to create a citywide conversation around such timely societal issues and to use its concerts to highlight its partner organizations and their work. With a focus on immigration – the search for home – this program adds a powerful theatrical element to the musical experience, with short plays by MacArthur “Genius” Grant-winning playwright Luis Alfaro and original, incidental music by Chris Rogerson. This concert highlights the important role of immigrants in making the music we enjoy today: Gershwin was a first-generation immigrant, and both Schoenberg and Carlos Kalmar found new homes in America. There’s no place like home, as the emphasis shifts to the environment – our collective home – with a concert that features commissioned video work by New York-based stage and multimedia designer Matthew Haber to accompany Stravinsky’s monumental Rite of Spring. The world’s most famous violinist once performed in the subway, where he was largely ignored and virtually anonymous. His social experiment is a fitting backdrop for a concert that explores the idea of homelessness – the need for a home – with a commission by Gabriel Kahane. With its music being shared ever more widely around the world, thanks to American Public Media’s SymphonyCast and Performance Today, as well as broadcasts by All Classical Portland, and with the current 2016/17 season poised to set another all-time high in ticket sales and contributions, the Symphony will maintain the 20% increase in the number of classical concerts established last season. During the newly announced season, the Symphony will record another CD on the PentaTone label, following the success of its recent CDs which have garnered three Grammy Award nominations in the last five years. The CD will focus on winners of the Pulitzer Prize for Music and include Gould’s Stringmusic, Piston’s Symphony No. 7, and Hanson’s Symphony No. 4 (Requiem). The subscription series begins on September 23, 2017 and closes on May 21, 2018. It includes 48 performances of 16 Classical subscription concerts (up from 40 performances in 2015/16), 8 performances of 4 Pops subscription concerts, and 3 performances of 3 Kids subscription concerts, for a total of 59 performances of 23 different subscription concerts. The season opens on September 16, 2017 with a Special Concert featuring renowned social justice/media mega-star and former Star Trek castmember George Takei, who will emcee the opening night concert and narrate Aaron Copland’s Lincoln Portrait. The season also includes two other Special Concerts: the Oregon Symphony joins forces with Pink Martini for a New Year’s Extravaganza, which includes the final “Ode to Joy” movement of Beethoven’s Ninth Symphony on December 30 and 31, 2017; and pianist Yuja Wang returns for a recital performance on May 3, 2018. The three Special Concerts are now available only to renewing and new subscribers. Every season, the Oregon Symphony performs between 20 and 30 concerts beyond its subscription series. These Special Concerts – under the Oregon Symphony Presents banner – span a wide range of genres. Patrons can expect the full slate of these Special Concerts to be announced in May. Percussionist Colin Currie returns for his third year as the Oregon Symphony’s Artist in Residence, a position that involves performing onstage as well as working around the community. Currie is an extraordinary classical music ambassador, deploying an array of percussion instruments, including his own body, to perform and teach in venues throughout the region. The season includes many classical favorites like Beethoven’s Violin Concerto, Shostakovich’s Fifth Symphony, Gershwin’s Rhapsody in Blue, Stravinsky’s Rite of Spring, Brahms’ First Symphony, Tchaikovsky’s “Pathetique,” Verdi’s Requiem, and Mahler’s Seventh Symphony, among many others. In addition to those favorites, the season enjoys four commissioned works and their associated world premieres from Andy Akiho, Marc-Anthony Turnage, Chris Rogerson, and Gabriel Kahane. In addition to those, the season is spiced with 14 other Oregon Symphony premieres, including Balakirev’s Islamey, da Ponte’s The Rising Sea, Adams’ Absolute Jest, Kokkonen’s Symphonic Sketches, Glanert’s Concertgeblaas, Piston’s Symphony No. 7, Hanson’s Symphony No. 4, Connesson’s Supernova, and Hindemith’s News of the Day Overture, among others. 2017/18 audiences will enjoy the return of some of the world’s best-known classical artists, performers who have won audiences’ favor for previous appearances, including pianists André Watts, Garrick Ohlsson, Kirill Gerstein, Natasha Paremski, and Francesco Piemontesi; violinists Joshua Bell, Augustin Hadelich, Elina Vӓhӓlӓ, Vadim Gluzman, and Oregon Symphony concertmaster Sarah Kwak; percussionist Colin Currie; and cellist Johannes Moser. Guest artists making their Oregon Symphony debuts include the St. Lawrence String Quartet; Benjamin Beilman, violin; Measha Brueggergosman, soprano; Lilli Paasikivi, mezzo-soprano; Dimitri Pittas, tenor; and Raymond Aceto, bass. Leading the orchestra for the very first time are conductors Baldur Brönnimann, Johannes Debus, Leo Hussain, David Danzmayr, and Jérémie Rhorer. The popular Jeff Tyzik continues his tenth year as Principal Pops Conductor, curating and conducting the Pops Series. The 2017/18 Pops Season includes eight performances of four separate Pops concerts, spanning the musical spectrum. The Pops Season gets off to an entertaining start in October with the Magic Circle Theatre Company and Phantoms of the Orchestra; A Pops Holiday concert with the Pacific Youth Choir and vocalist Ashley Brown (Broadway’s Mary Poppins) celebrates the festive season in November; in February, just before the 2018 Oscars, we celebrate the man with the greatest number of statues to his name with John Williams at the Oscars; and the Pops season concludes with The Hot Sardines in April. Young audiences are an important part of the Oregon Symphony family. This year’s Kids Concerts, conducted by Associate Conductor Norman Huynh, feature kid-favorite Pam Mahon as narrator and performer in programs designed especially for the young and the young at heart: Star Wars Spectacular in November with the Pacific Youth Choir and Dance West; Dinosaurs! in January; and Along the Oregon Trail in March, again with the Pacific Youth Choir and Dance West. Oregon Symphony subscribers will receive their renewal packets beginning today and have until March 31 to renew their seats or request seating changes. New subscribers may purchase their season tickets beginning immediately. Tickets to the George Takei, Pink Martini, and Yuja Wang Special Concerts are available at this time only to patrons renewing their subscriptions or purchasing new subscriptions. Tickets to all Oregon Symphony series concerts will go on sale to the general public in August. Pops Series subscriptions begin as low as $84 for all four concerts. Kids Concert Series subscriptions begin as low as $27 for all three concerts. Subscriptions may be renewed or purchased online at OrSymphony.org; by phone at 503-228-1353; or in person/by mail at 909 SW Washington, Portland. For more information, go to www.orsymphony.org or call the Ticket Office at 503-228-1353. The Oregon Symphony performed a near-all-Russian program last weekend with works by Prokofiev, Stravinsky, and Tchaikovsky providing the main meal and the young American composer Sean Shepherd adding a Russian-inspired appetizer. I heard the concert on Saturday (January 28) at the Arlene Schnitzer Concert Hall with violinist Stefan Jackiw, making a return appearance as the featured soloist. He and the orchestra, led by music director Carlos Kalmar, sounded as good as ever, and each piece received a radiant interpretation. Jackiw gave an impeccable performance of Prokofiev’s Second Violin Concerto. His playing transcended the numerous technical challenges of the piece, especially when he had to transition between lightening quick and slow-moving passages. He impressively elicited a lovely very high melodic line against the tic toc the orchestra in the second movement and followed that with a wonderfully loosey-goosey slightly-off kilter delivery in the third. His short duet with the double basses right before winding up the piece on a high note an extra delight. I never thought that Stravinsky would write sentimental music, but he did just that with the “Divertimento” that he created from his ballet “Le baiser de la fée” (“The Fairy’s Kiss”). The performance by the orchestra contained an intoxicating intermingling of Stravinsky takes on Tchaikovsky like themes. As soon as a Tchaikovsky-inspired riff appeared, it would take on a Stravinsky-ish quality, such as a quirky rhythmic pulse or an odd flight of fancy. The orchestra created many finely etched and lushly lyrical moments, and there were many highlights that showed off the principals. Flutist Martha Long and clarinetist James Shields delivered lovely plaintive solos. John Cox whipped through one of the squirreliest passages for French horn that I’ve ever heard. Trombonist Daniel Cloutier’s solos were strong yet never strident. Concertmaster Sarah Kwak and her first desk colleagues Chien Tan, Joël Belgique, and Nancy Ives played a delightfully brief quartet excursion. 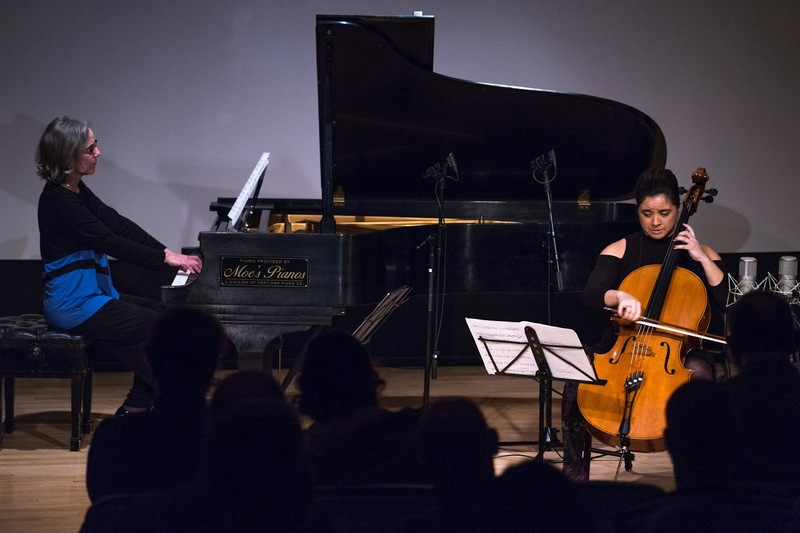 Ives teamed up with harpist Jennifer Craig to create a tender and affectionate mood, and Ives extended that sentiment later when the orchestra re-entered to stagger off the beat into a punchy finale. The Stravinsky was followed by Tchaikovsky’s “Romeo and Juliet” Fantasy Overture, which the orchestra played with élan. The opening measures, graced by Craig’s harp, sounded like a flower opening through the mist. Crisp attacks and the slashing sounds from the violins evoked the fight between the Montagues and the Capulets. The hushed melody of the love theme was superbly played. Kudos to bassoonist Carin Miller Packwood and Kyle Mustain on English horn for their keenly expressive contributions. Shepherd wrote “Magiya” (“Magic”) in 2013 for the National Youth Orchestra of the United States. It’s a one-movement work that lasts around seven minutes, but in those seven minutes a lot happens. The music takes off quickly and the pace never slows down. Brilliant and spikey sounds emerge from all corners of the orchestra. Chattering violins, near-bell-like sounds flashed, creating an auditory illusion and misdirection. Somehow the piece ended in a delightful cacophony, and before I knew it, I wanted to hear it again. Fortunately the orchestra recorded the piece for a future CD. In his prefatory remarks for the concert, Kalmar included a rare personal note about his parents becoming refugees after fleeing the Nazis and the unifying power of music. His statement was an eloquent rebuttal to the travel ban on Muslims that was issued by the Trump administration, and it received thunderous applause and cheers.